How was your Thanksgiving? We are having the best time in Vegas, and I can’t wait to share with you some of my favorite eats next week. For now, I’m just popping in with my favorite monthly finds for November complete with a killer giveaway! I am so excited to share this product from myMix Nutrition. 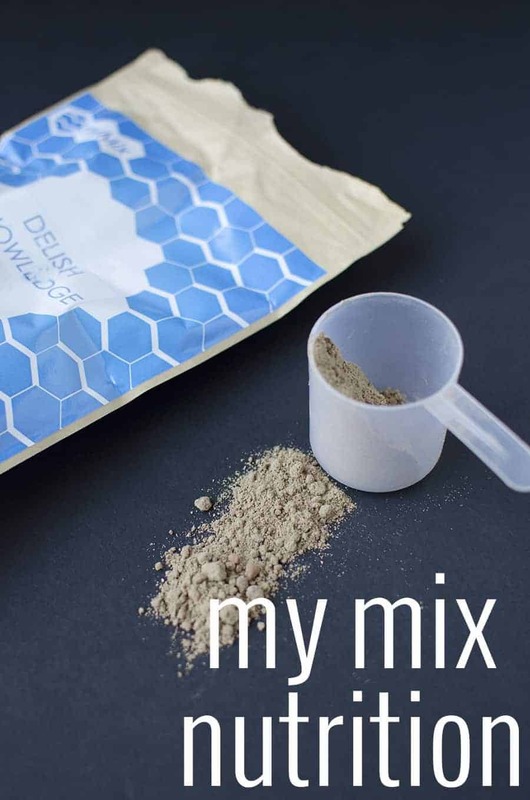 These ready-to-mix powder supplements are completely customizable so you can create your morning smoothie ingredients from scratch. As an RD, I love having the ability to customize supplements based on exactly what I need. Besides the individualized approach, I’ve vetted their ingredients and am happy to say they have passed my test for quality. For fun, I created my own ‘Delish Knowledge‘ mix that’s perfect for my needs. Since I usually consume my morning smoothie after my workout, I designed this mix to be a post-exercise nutrition shake. Each serving contains vegan protein powder, L-Glutamine (for recovery), Flaxseed, Chia Seed, B-Vitamins, Probiotic, Antioxidant Superfoods, and a Greens Blend. Breakfast, multivitamin, and superfoods all in one ready-to-make shake. I’ve asked myMix to keep my Delish Knowledge mix up for a few weeks for you to try, just choose Chocolate (Check out here) or Vanilla (Check out here) and enjoy a 10% off the list price with the code Delish10. Or you can create your own mix (great for holiday gifts) in either 5, 10 or 20 serving packages. Since I’ve been on a monthly food find over past few months, I thought it would be fun to try one of those subscription services that lets you try a bunch of different foods in one box. After checking out a few different boxes, Yumvelope looked like the most fun! 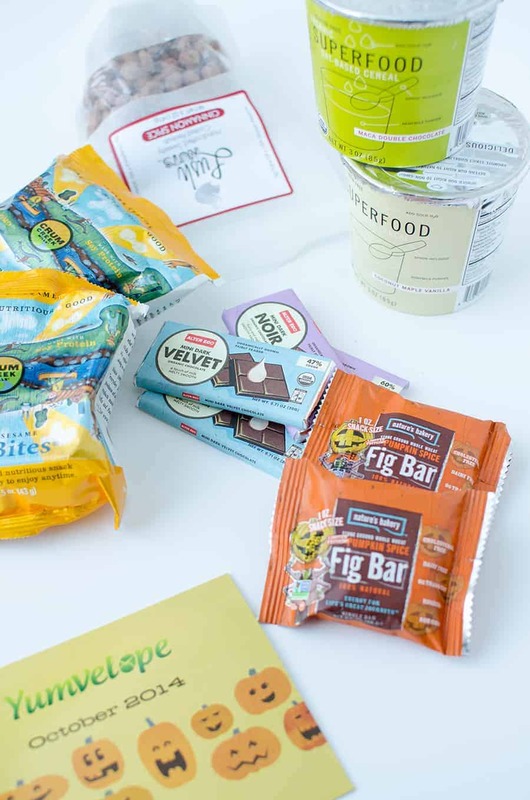 For subscribers, Yumvelope sends a box of six full-sized natural snacks, drinks or desserts each month. October’s box was filled with cereal, bars, peanuts and soy bites. Of all of the products, I loved the Vigilant Superfood Cereal the best! YUM. These are oat-based cereals where you add water, stir and eat! Perfect for mornings on the run when you don’t have your handy jar of overnight oats ready. Of course, my second favorite was the Alter Ego Chocolate Bars because… chocolate. I’ve been trying to make more fair-trade food purchases lately, especially when it comes to coffee, chocolate and spices, and I feel like this is a brand I’ll be buying again and again. You can enter to win next month’s box in the contest below! Clearly, this one has been getting lots of love. 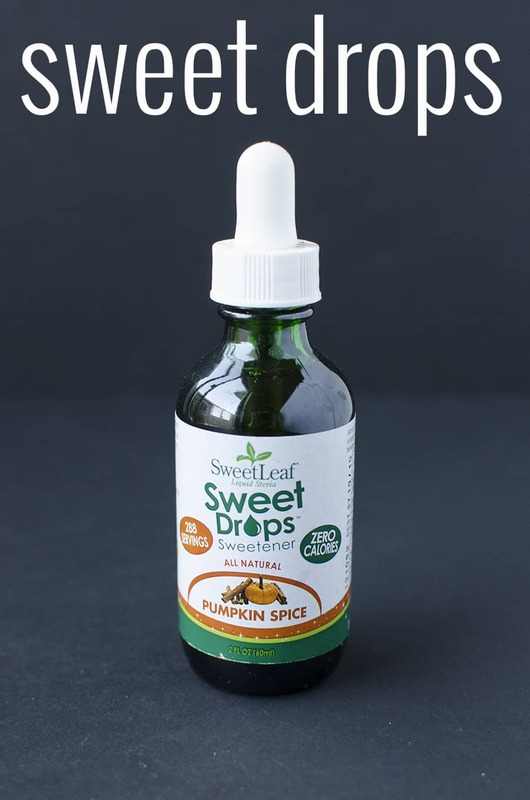 While I usually drink my morning coffee black, I have been enjoying a drop or two of these Pumpkin Spice Stevia Sweet Drops for an extra pick me up. It’s perfect for bringing a little festive cheer to the start of my day, without the extra calories and fat of traditional PSL’s. Wanna try these Food Finds for yourself? To enter to win a bottle of the Pumpkin Spice Sweet Drops AND next month’s Yumvelope box, comment below telling me what food you are most looking forward to over the holidays. I’ll select a winner next week! I am most looking forward to my favorite indulgent at the Holiday’s, homemade mashed potatoes! Oh and also maybe more of your pumpkin pecan bars! I most look forward to my mom’s apple pie on Thanksgiving. I’m most looking forward to spending time with family I haven’t seen in awhile, and finding the perfect gift for them. I look forward to lots of homemade food and treats over the holidays, especially the ones I only get once a year. I usually make my smoothies after my morning workout out too and love the idea of customizing them with supplements/plant protein powder. Thanks for the suggestions. The Yumvelope box I’ve never heard of (and I do like subscription boxes) but it looks nifty! I am most looking forward to all the pies for the holidays…oh and the holiday cookies too! The food I am most looking forward to over the holidays is my mother’s magic cookie bars. They are the same cookies bars she has made every Christmas since I was a child. Though I’m now a middle-aged mama who loves to cook and bake, I don’t make these so that I can be sure she will make some! Her’s certainly are magic! Thank you! I am looking forward to having my family home for Christmas season and sharing some of your great recipes, like the ‘sage mac and cheese’ and of course the pecan pumpkin bars as I made them for Thanksgiving and they were a huge hit and making them this week for my office holiday party. I love pumpkin spice flavor, so I am excited to try the pumpkin spice drops in my coffee as well. Thanks Alex, I love your site and trying all your great recipes. Christmas cookies!!! I haven’t had any yet. I’m most looking forward to delish roasted turkey. My fam is not a big fan of turkey so I only get it once or twice a year!! That Pumpkin Spice stevia is very, very intruguing! I’ve had a craving for gingerbread – the flavors just scream holidays! Me too! Yes, the Stevia spice is really good! Just a drop makes anything you are drinking taste like pumpkin! I am looking most forward to spending time with my hubby. He’s off work around the holidays and I miss seeing him as much. Love that! That’s probably one of my favorite parts about the holiday as well. BL and I are fortunate that we both get a week off for the holidays and I treasure that extra “us” time together. I’m definitely looking forward to pumpkin pie, apple pie, cookies… basically dessert. And gaining a few pounds! Ha! That’s one of the best parts of the holidays- and I never sweat the pound or two that comes with the holidays. I would rather have to work a little harder in January than forgo my favorite foods and gatherings this time of year.